Build your personalized loft storage quotation in just a few simple steps. If your home was built before the year 2000, please use our original cost calculator. ▸ Why use our calculator? For loft storage work, we do not need to survey your home. The quotation generated by this cost calculator is guaranteed, with no hidden extras. All prices include materials, fitting and VAT and all work is covered by our no-quibble lifetime warranty. Rest assured, if you miscalculate and either over or under order, you will only be charged for what is used on the day. Plus, you save an extra 5% when you pay a deposit and book your installation date online! ▸ Prefer a home visit and quotation? If you would prefer us to visit your home in person and survey your loft in order to provide a quotation, we are happy to do so. Your written quotation will be fully itemized and drawn up on company letterheaded paper. You will be quoted exactly the same prices as are used in our calculator, but you will not qualify for a 5% discount. A small deposit will then secure your installation date. You pay the balance of the final invoice at the end of the job when you are happy with everything. Read more about our home visit loft surveys. ▸ How do I use the calculator? We make generating your personalized, guaranteed quotation easy, with just a few simple steps. Select the elements you want for your personalized loft storage quotation. Bronze Package Great value loft access! Silver Package Great value loft package! Gold package Our most popular deal! New Build Loft PackageLarge storage loft package! 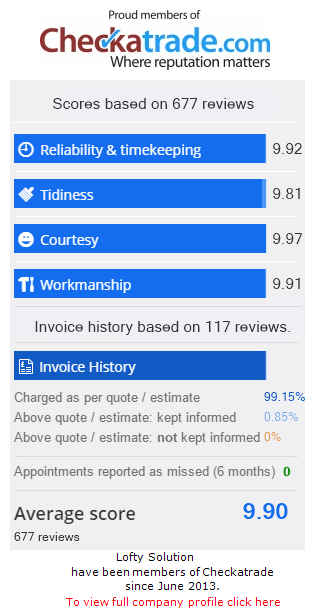 What did our customer think? "I couldn't be happier, we were looking for usable storage space and the three lads that did the work were quick, clean and efficient. Really happy with the end product and in fact the whole experience. Quote was competitive, but the fact that they were professional and family based swung it for me. I wasn't let down, top class and I will use again." We've selected 2 quality ladders that are perfect for new build homes. Prices include fitting and our famous lifetime warranty. 0 1 2 3 4 3 section Youngman aluminium ladder (£129 + VAT each). Your loft hatch must be a drop-down design to fit this ladder. See options below. Manthorpe drop-down uPVC hatch 74cm X 55cm (Includes enlarging the existing loft entrance if required) (£120 + VAT). 0 1 2 3 4 Fakro luxury timber loft ladder and hatch (111cm X 55cm) for ceilings up to 2.8m in height (£329 + VAT each). Comes with safety handrails, integrated hatch, quality rubber footings and finished off beautifully with architrave to the ceiling. Select any combination of lights and double sockets. The LED lights we supply and fit use only 10% of the power of other bulbs and don't produce any heat, making your loft a safer place. We recommend one light for every 10 feet (5 trusses). All prices include fitting and our famous lifetime warranty. Want some extra boarding, or shelves? Just add these to your package. Boarding out a loft includes strengthening the ceiling joists with a timber brace and raising the floor level above the insulation. We construct a new floor using 8' x 2' moisture resistant, humidity treated, PS 18mm floorboards. In a new build home the width of the internal span is approximately 8 feet with the trusses set at intervals of 2 feet. This can help you estimate the amount of boarding you require. As a guide, the average loft space is 35M². If you want to add boarding to your quotation, you must select a minimum area of 6M²*. All prices include fitting and our famous lifetime warranty. You've selected our famous New Build Loft Package, so you already get 15M²* as part of the package. To increase this, please select the TOTAL boarding area you would like. * Due to the standard size of the boards, purchasing M² of loft boarding will result in a slightly smaller final surface area. Select any number of Velux windows. All windows come fitted with a flashing kit. Prices include fitting and our famous lifetime warranty. This quotation includes all the following items, fitting and our famous lifetime warranty. Don't miss out! Fill in your personal details below, select an installation date and pay a 25% deposit via PayPal to save an extra £6.45 today. Can I have a home visit and quotation? Why do we charge VAT? We are a well established VAT registered loft storage company. Every loft storage company should be registered for VAT as the threshold is only 85k and when you are buying materials you quickly go over this. You may have noticed that many of the loft storage companies in the north east aren't charging VAT which may make their quote appear better value. The problem is that if these firms are dodging their legal tax obligations what other corners are they cutting? Are they insured and is their guarantee worth anything? Lofty Solution have been trading for many years and do not believe in cutting corners, so you can have peace of mind that you are using an honest and trustworthy loft firm. Read more about what makes us different to other loft storage companies. We try and make generating your personalized, guaranteed quotation as easy as possible. However, if you do miscalculate and order the wrong quantity or items, we will discuss your options with you and you will only be charged for what is used on the day and you will still receive your 5% discount for booking online. Your quotation has been updated! Don't forget, to qualify for your 5% discount you need to book your installation date and pay a 25% deposit via PayPal.